Apple has launched its “iOS 10” recently which is having more new features — you would love it. 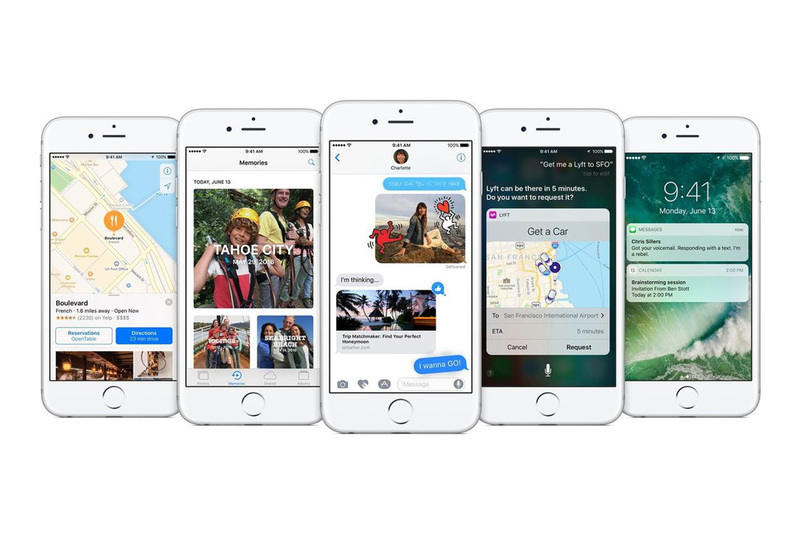 Unveiled earlier this summer, iOS 10 is anticipated as the most significant iOS revamp since the company overhauled its mobile design with iOS 7 in 2013. The latest version of the iPhone and iPad software will come with the iPhone 7 and 7 Plus from September 16. If you have an older device you will be able to download the update now. Initially when the iOS 10 was launched, Many users experienced major issues with their iPhone & iPad, as the update process failed with a subsequent error message asking users to plug their iOS device into a PC or Mac for a complete restore of the operating system. Later, Apple confirmed that they made a fix for that failures and users can download the iOS 10 without any problems. Find My Car: Siri automatically detects when you’re driving and drops a pin at the location you stop, so you can easily find it later. Avoid Tolls: when setting a route, you can now choose to specifically avoid toll roads. A nice Google Maps catch up feature. Location Suggestions: In iOS 10 when you enter a Calendar event you will find locations are suggested automatically using Apple Maps. This is a catch up to Google Calendar in Android which taps into Google Maps for the same functionality. App Widgets: Shortcut: 3D Touch on an app that supports widgets and you will get a preview of the widget and the option to quickly add it, along with the usual 3D Touch shortcuts. Prioritize App Installs: when restoring a device or installing multiple new apps you can use 3D Touch to long press on any app waiting to be downloaded on the homescreen and you will get a ‘Prioritize Download’ option, to save you waiting around. Optimized Storage: Apple Music settings now allow you to automatically free up space by removing downloaded tracks you haven’t listened to after a predefined period. Go to: Settings > Music > Downloads. They can always be re-downloaded later. Smart Downloads: go to Settings > Music > Downloads and switch ‘Automatic Downloads’ to on and you will find any album can be quickly downloaded by tapping the ‘+Add’ button. Useful for those who do a lot of offline listening (such as frequent flyers). Don’t Stop The Music: Apple has stopped the camera mode automatically killing any music recording from the device the moment it is opened. Great if your phone is also the source of music for a party. Music still stops if you want to record a video or Live Photo. Bedtime Reminders: open the Clock app and you’ll find a new tab: ‘Bedtime’. This can be used to define the typical times you go to bed, wake up and the length of sleep you prefer. You then get reminders and along with tracking of your sleeping habits which can be viewed in the Health app. Safari – Close All Tabs: Quickly ditch your browser tabs on iPads with a long press on the Tab View button, which brings up the close all tabs options. iPhones require an extra step: open Tab View then long press on ‘Done’, to generate the option. Notifications – Close All: Sick of the tiny ‘x’ on each notification? In iOS 10 you can remove them all at once with a 3D Touch iPhone. Just use a harder press on the X at the top of the list and you will get a ‘Clear All’ option. A really useful feature hidden behind the glamour or ‘Rich Notifications’. Quick Timer Options: bring up the Control Center and owners of 3D Touch enabled iPhones can use a harder press to bring up 1, 5, 20 and one hour instant timer options. Calculator Memory: 3D touch the calculator icon in the Control Center and you can copy in the answer to your last calculation, saving precious time. Camera shortcuts: just like the Camera icon on the homescreen, 3D Touch options have been extended to bring up specific shooting modes for the camera icon in the Control Center. Music & Home Hidden: strangely, Control Center in iOS no longer shows music controls on its mainscreen. To access this you have to swipe left and if you swipe left once more you get shortcuts for the Home app. Flashlight Tweaks: For 3D Touch enabled iPhones (6S and above) open up the Control Center and use a harder pressure touch on the flashlight icon to get low, medium and high brightness options. Read Receipts: users can now request notifications for when their messages to other iMessage users have been read. Image Search: When writing a message, tap the App Store icon and you can swipe to an images page and search for anything you want. Save Data: Go to Settings > Messages > Enable Low Quality Image Mode. Hello Third Party Apps: highlight a word in iOS 10 and you will find ‘Define’ has been replaced by ‘Look Up’ and includes the option to search for the term in the App Store, Apple Music, online search or Wikipedia. There’s third party app support for this as well. Restore Touch to Unlock: iOS 10 requires users to physically press the home button to unlock their devices, rather than just make contact for the Touch ID fingerprint scanner. If you don’t like this go to: Settings > General > Accessibility > Home Button and enable: ‘Rest Finger to Open’ to get the old method back.